Coat a 9x5" loaf pan with nonstick cooking spray. Toss the pineapple with the raisins and set aside. Whisk the flour with the baking powder, baking soda, cinnamon, nutmeg, ginger, and salt and set aside. Beat the egg, egg white, brown sugar and oil with an electric mixer set on medium until smooth. Add the honey and vanilla and beat again. Drain any accumulated juice from the pineapple-raisin mixture. 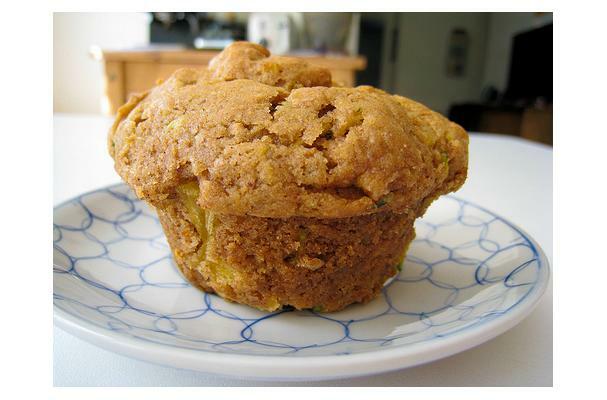 Stir the flour, pineapple-raisin mixture, and zucchini into the batter by hand until just combined. Scrape the batter into the prepared pan and bake for 45-55 minutes or until a toothpick inserted in the center of the loaf comes out clean. Cool the bread in the pan set on a wire rack for about 10 minutes. Turn out onto a wire rack and cool completely. Here's a recipe for zucchini bread that I made last month. It's very tasty and uses a fair amount of zucchini, though not nearly enough given the way my plant is producing!